I HAD to read the next installment after To All the Boys I've Loved Before finished the way it did. I thought the pace was slower than its predecessor but I still enjoyed it as much as the first one. 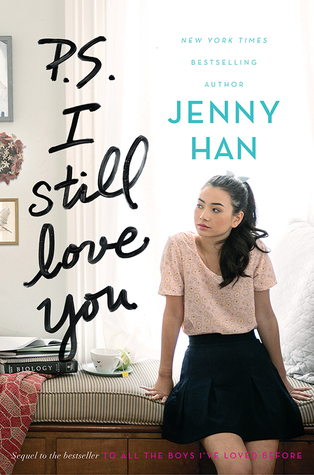 Lara Jean wants Peter back. She will go for it despite her worries about putting her heart on the line and the possibility of getting hurt. You have to admire someone who decides to overcome her fear of being abandoned. So what does Lara Jean do? She writes a letter to Peter K but this time she takes it to Peter K herself. Gladly, he is home when Lara Jean comes knocking. This is when I start thinking that everything is going to be ok now. They are together, what can go wrong? One answer, Genevieve. Genevieve keeps on using Peter for who knows what. She keeps on calling him and the worst part is that Peter answers every single time. Yes, Lara Jean knows Peter cares for Genevieve but at the beginning, she is more accepting of this situation until she is not. To make the waters even murkier, another boy she wrote a letter to is back. You might remember the tiny sneak peak we got in the first book about John Ambrose McClaren, well he's back in full force. He's the grandson of Story, an awesome lady with amazing stories to tell and who's at the retirement house where Lara Jean is volunteering. John Ambrose is everything Lara Jean wants from a boyfriend and he even helps her out when she needs it during the USO party she throws at the retirement house (I would love to see this in the next movie. Their scene together was beautiful). John Ambrose McClaren is dreamy but he is not Peter K and sometimes the heart wants what the heart wants. I was torn between both guys which is weird because I was Peter K team all the way in To All the Boys I've Loved Before. Yet, I was very happy with Lara Jean's decision and I was happy she made good choices too. I thought the book portrayed a nice relationship between the siblings. They had an awesome relationship with their father (I adored him) which was a nice change since most books have horrible family dynamics. Kitty, as well as Stormy, gave this book the sassiness it needed.